London's favourite urban youth showcase and networking event - #RateMePlz is back with a bang this December. Hosted by founder - Remel London, the end of year showcase and networking event will see singers, songwriters, rappers, producers and more all under one roof to experience a night of music and entertainment at the Ultimate Networking Experience. The night will include performances from #RateMePlz winners and industry showcase winner: Ms Banks, Ojerime, Elektric + GT Solo, Beverly Ely, Wilson. 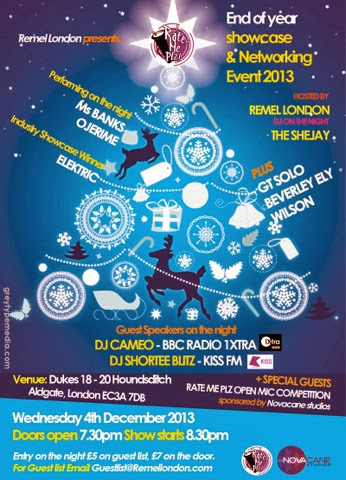 As well as special guest speakers: DJ Cameo (of BBC Radio 1Xtra) and DJ Shortee Blitz (of KISS FM). This is an event not to be missed at all, previous guests include on-air-presenters from BBC 1Xtra, and Capital Xtra, Jamal Edwards of SBTV, respectable A&R's and music marketing professionals from Island Records, Virgin Records, and Roc Nation Europe and so much more. So you know this event will be hot, so be ready to network and see some potential forthcoming stars on the night.